ISO – ISO 9001 sets out the criteria for a quality management system based on a number of principles including customer focus, leadership, involvement and motivation of people, the process approach and continual business improvement, factual decision making and excellence in supplier relationships. ISO 9001 has helped us at Auto Mate Systems Ltd. ensure that customers get consistent, high quality products and services. We were first approved in 1998 and continue to be so after we obtained 100% pass rate in our most recent audit in July 2018. Constructionline Membership – Constructionline is the UK’s largest register of pre-qualified contractors and consultants. It means that companies like ourselves, Auto Mate Systems Ltd, no longer need to repeatedly fill in standard pre-qualification forms for every construction tender, enabling the process to be more efficient in time and cost for all parties. We most recently had our Gold membership approved, in July 2018. Safe Contractor Membership – The Safe Contractor Membership was designed to review and audit the health and safety policies, procedures and documentation of contractors. Being a member of the Safe Contractor accreditation is important to us at Auto Mate Systems Ltd, as it is a way of showing our continued commitment to Health & Safety. CSCS Platinum – CSCS is the leading skills certification scheme within the UK’s construction industry. These cards provide proof that our engineers have the required training and qualifications for the type of work that they carry out on construction sites and industrial sites alike. Holding a CSCS card is not a legislative requirement but at Auto Mate Systems Ltd we like to assure our customers and partners that our engineers are working to the highest standards possible, therefore making it mandatory that our engineers carry them as proof of their high quality and qualified workmanship. CHAS Premium Plus Approved – As a CHAS Premium Plus accredited contractor, Auto Mate Systems Ltd are committed to providing a safe and efficient workplace and work area. Working together with CHAS, we strive to improve our business, create further business opportunities and drive industry standards to a higher level in order to make both the industry and the working world a safer place to be. In a similar way to Constructionline, CHAS has reduced the number of duplication documents and productions of information that is requested from buyers and customers, therefore saving time and effort which can be used elsewhere. 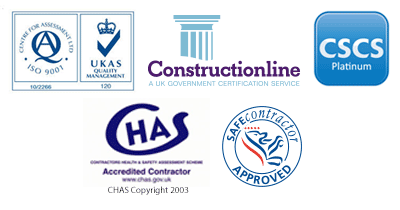 As of December 2018, we are an officially CHAS Premium Plus approved contractor.